Sufi Kathak Foundation, The Royal Opera House, Mumbai and Avid Learning present an evening of stories, music and dance with a theatrical dance performance by Kathak Dancer and Founder of the Sufi Kathak Foundation Manjari Chaturvedi that will pay homage to early depictions of courtesans in film. This performance, conceptualized, created and directed by her, celebrates the women performers of Bollywood and brings back to life the magic, grace and soul of the Tawaif. More than a dance relived; it is a story retold. This enchanting performance is an ode to erstwhile and now forgotten women performers whose stories will be retold as dramatic interludes throughout the performance. 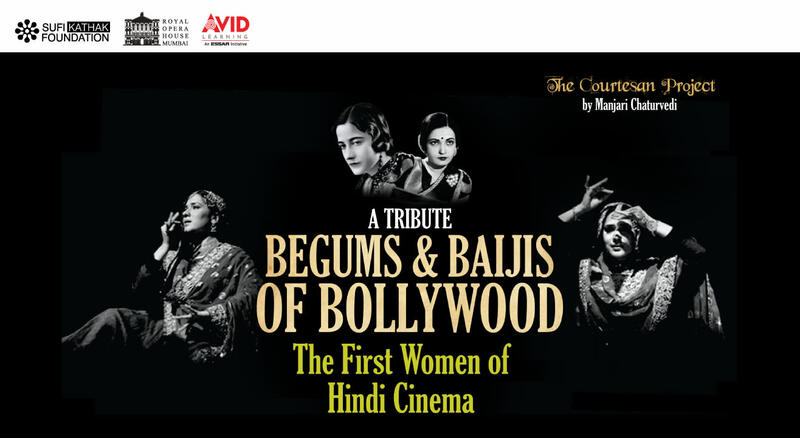 Do not miss an evening that celebrates the Tawaif’s unique art and contribution to the world of Hindi Cinema. Manjari Chaturvedi is a Classical Dancer, Director, Choreographer, TedX Speaker and Cultural Academic. Among the 300 concerts that she has performed in 20 years, a few prestigious venues include the Symphony Space, New York City, Judith Wright Centre For Performing Arts – Brisbane, Sydney Opera House, Australia, National Gallery Of Victoria, Australia, Rashtrapati Bhawan, New Delhi and Parliament House, New Delhi. She is the leading exponent of classical dance in India. Her productions as a dancer are projects that are meticulously researched and documented; it includes gender sensitive subjects that through her medium of dance, explores the many traditions woven into poetry and music. Under the banner of the Sufi Kathak Foundation she supports similar research and encourages marginal artists to participate in dissemination of their art. She has been the part of the Sufi Symposium at the prestigious Smithsonian Museum Washington D.C. and of the conference on Living heritage by UNESCO and is the Jury and member of “Think Tank on Asian dance” for the prestigious Asian Dance Committee in Korea. The Sufi Kathak Foundation is a non-profit registered society in India (Regd. 61883, exempt from tax under section 80G and 12A and registered under FCRA). The Foundation is headed by its Founder & President, Manjari Chaturvedi, a leading exponent of classical Indian Kathak & creator of Sufi Kathak dance. She has a deep interest & in-depth knowledge on performance art & with her own experience of 20 years, with more than 300 performances in 24 countries, she leads the research projects. The General Body of the Foundation comprises of other 10 eminent academicians, lawyers, marketing heads, art & cultural activists & personalities. Sufi Kathak Foundation in 10 years has conducted 38 festivals /seminars/ concerts involving 402 artists to create awareness about India’s intangible heritage in music and dance and preserve the gradually fading 700 year Sufi Traditions in Music and Dance. SKF aims to create a world of cultural unity, by spreading the secular message of the Sufis and also help in initiating children and orienting the youth to become self-employed through arts - dance and music. It provides assistance and support to needy artists and students by giving scholarships, pensions and medical support, in order to enable them to pursue classical music and dance. SKF seeks to evolve a humanist outlook and create centers, organize training classes, workshops and musical concerts to promote Sufi music, Qawwali, Sufi Kathak, and folk & classical dance across the world. Sufi Kathak Foundation has also worked with the Government of India and State Governments for various cultural concerts organized by them and through its concerts the foundation has tried to relive the past eras, thereby representing our rich cultural heritage. Sufi Kathak Foundation has also conceptualized and organized cultural festivals which explored the inter-religious issues through music and dance and brought together references of different religions on the same plane of confluence, for the audiences to experience. The 22 Khwaja Project that explores the lives of Sufi Saints is a unique secular initiative that has never appeared before the masses and adds to the list of successful initiatives taken by the Foundation. “The Courtesan Project”, is the flagship dance revival concept by Sufi Kathak Foundation. “The Courtesan Project” is a labor of love, and a culmination of passion, research and mission to bring alive the stories of women largely forgotten by the history.